Small Beer Press, 9781931520003, 266pp. The eleven stories in Kelly Link's debut collection are funny, spooky, and smart. They all have happy endings. They were all especially written for you. A Best of the Year pick from Salon.com, Locus, The Village Voice, and San Francisco Chronicle. Includes Nebula, World Fantasy, and Tiptree award-winning stories. Link lives in Northampton, Massachusetts, where she and her husband, Gavin J. Grant, run Small Beer Press, co-edit the fantasy half of The Year's Best Fantasy and Horror, and play ping-pong. In 1996 they startd the occasional zine Lady Churchill's Rosebud Wristlet. 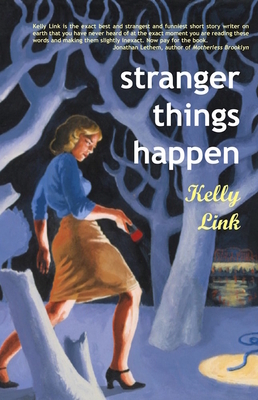 Kelly Link is the author of two collections, Magic for Beginners (chosen as a 2005 Best Book by Time Magazine, Salon.com, and Book Sense) and Stranger Things Happen. She is the editor of the anthology Trampoline. She and her husband Gavin J. Grant started Small Beer Press in 2000.